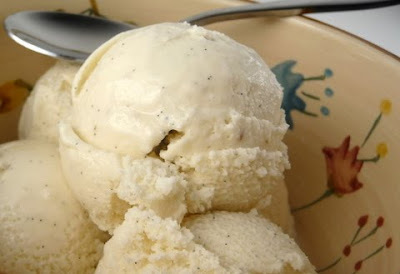 I should call this recipe - quadruple vanilla bean ice cream - it uses real vanilla beans, pure vanilla extract (I make my own using vanilla beans and vodka), vanilla sugar (also homemade - its just sugar and vanilla beans) and vanilla soy milk. 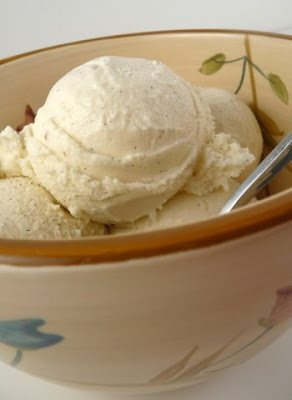 As with all of my other ice cream recipes so far - this one is from David Lebovitz. Except this one is even easier than the others since it doesn't require a custard base - it's called Philadelphia style - there are no eggs. The changes I made are using the vanilla sugar, upping the vanilla extract amount and using the vanilla soy milk in place of the whole milk - just because we always have vanilla soy milk in the house (my husband is addicted to it). I hoping to make some more ice cream recipes with soy milk if anyone has any suggestions for recipes! Enjoy! 1. Pour 1 cup of the cream into a medium saucepan and add the sugar and salt. Scrape the seeds from the vanilla bean into the saucepan and add the pod to the pot. Warm over medium heat, stirring, until the sugar is dissolved. 2. Remove from the heat and add the remaining 1 cup cream and the milk and the vanilla extract. 3. Chill the mixture thoroughly in the refrigerator. 4. When ready to churn, remove the vanilla bean, rinsing and reserving it for another use (I add it to my vanilla sugar). 5. Freeze the mixture in your ice cream maker according to the manufacturer’s instructions. This is a staple in my home. Looks delish!